Our Day of the Dead dioramas show miniature skeleton scenes behind glass. These mostly fun and festive scenes are created with clay and hand painted by Mexican folk artists. They are encased in a wooden painted box with a glass cover. 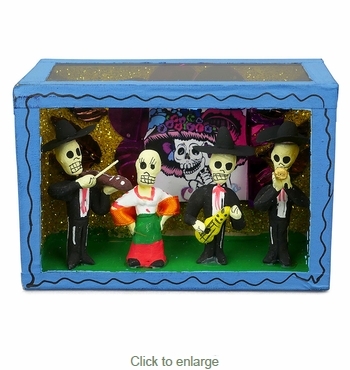 See all of our Mexican Day of the Dead Dioramas. Measurements are approximate, exact detail and theme of each will vary. Most likely you won't receive the same scene pictured here.